Over de Ziekte van Alzheimer is nog veel onduidelijk. 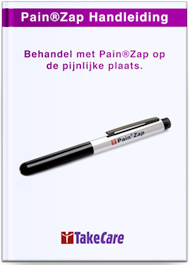 Plasmalogenen, die belangrijke structurele fosfolipiden zijn in hersenmembranen, zijn verlaagd in de hersenen en het serum van patiënten met de ziekte van Alzheimer (AD). In dit wetenschappelijk artikel wordt ingegaan op de functie van plasmalogenen zowel voor de gezonde mens als ingeval van verlaging bij ziekte. Plasmalogenen spelen naast bij de Ziekte van Alzheimer eveneens een belangrijke rol bij ziekte van de luchtwegen en een bijzondere erfelijke stofwisselingsziekte Rhizomele chondrodysplasie punctata (RCDP). Plasmalogens are a unique class of membrane glycerophospholipids containing a fatty alcohol with a vinyl-ether bond at the sn-1 position, and enriched in polyunsaturated fatty acids at the sn-2 position of the glycerol backbone. These two features provide novel properties to these compounds. Although plasmalogens represent up to 20% of the total phospholipid mass in humans their physiological roles have been challenging to identify, and are likely to be particular to different tissues, metabolic processes and developmental stages. Their biosynthesis starts in peroxisomes, and defects at these steps cause the malformation syndrome, Rhizomelic Chondrodysplasia Punctata (RCDP). The RCDP phenotype predicts developmental roles for plasmalogens in bone, brain, lens, lung, kidney and heart. Recent studies have revealed secondary plasmalogen deficiencies associated with more common disorders and allow us to tease out additional pathways dependent on plasmalogen functions. In this review, we present current knowledge of plasmalogen biology in health and disease. This article is part of a Special Issue entitled: Metabolic Functions and Biogenesis of peroxisomes in Health and Disease. ► Plasmalogen synthesis and regulation. ► Unique roles ascribed to these molecules: anti-oxidants, membrane structure, signal transduction. ► Primary plasmalogen deficiency disease states: RCDP. ► Secondary plasmalogen deficiency disease states: respiratory disorders, Alzheimer disease. ► Plasmalogen replacement therapy. In 1924, Feulgen and Voigt  coined the term plasmalogen to describe an unknown compound that produced a plasma aldehyde after acid treatment. By 1957, Marinetti and Erbland  had characterized the parent compound as a glycerophospholipid (GP) containing an acid labile vinyl ether group at the sn-1 position. The chemical nature of the vinyl ether group was referred to as a ‘masked’ aldehyde by Ford . Plasmalogens are widely found in anaerobic bacteria, invertebrate and vertebrate animal species. Their absence in aerobic and facultative aerobic bacteria, and most fungi and plants, suggests an appearance, disappearance and reappearance of plasmalogens in evolution, supported by major differences in their biosynthesis between anaerobic bacteria and animals. This interrupted evolution might be explained by the lability of the vinyl-ether bond to oxidation and the ability of higher organisms to utilize this in an advantageous manner, as well as to enable other unique functions that emerged in multicellular animals . GP species are distinguished by their polar head group at the sn-3 position of the glycerol backbone, mainly being choline or ethanolamine, and to a lesser extent, inositol, serine or rarely, threonine. Further diversity is introduced by the components at the sn-1 and sn-2 positions, composing subclasses of diacyl and ether GP. Ether GP species differ from the more common diacyl subclass in having a fatty alcohol, rather than a fatty acid, at the sn-1 position. The fatty alcohols utilized are mainly restricted to saturated C16 (C16:0), or saturated and mono-unsaturated C18 (C18:0, C18:1) carbon chains and are linked by an unmodified 1-0-alkyl ether bond, also termed a plasmanyl GP, or modified to contain a vinyl ether, or 1-0-(1Z-alkenyl) bond, termed a plasmenyl GP or plasmalogen (Fig. 1) . The majority of ether GP species are plasmalogens. At the sn-2 position, plasmalogens are enriched in polyunsaturated fatty acids, specifically docosahexaenoic, C22:6 ω−3 (DHA), or arachidonic acid, C20:4 ω−6 (AA). In general, 1-0-alkyl groups are more prominent in choline GP (GPCho) and typified by platelet activating factor, a potent inflammatory mediator having the structure 1-0-alkyl-2-acetyl-sn-GPCho. 1-0-(1Z-alkenyl) groups are found primarily in ethanolamine GP (GPEtn). Fig. 1. Structures of Diacyl GP, Plasmanyl GP and Plasmenyl GP, or Plasmalogen. X denotes the polar head group, which is typically ethanolamine or choline. R1 denotes the carbon chain at the sn-1 position, and R2 at the sn-2 position. Plasmalogens constitute ~ 15–20% of total phospholipids in cell membranes, with ≥ 50% of the GPEtn fraction in brain, heart, neutrophils and eosinophils; in regions of the brain they may constitute up to almost 90% of the GPEtn fraction . They are also enriched in kidney, lung, and skeletal muscle (Table 1). Cardiac and skeletal muscle, as well as mature spermatozoa contains a high proportion of both PlsEtn and PlsCho species. Plasmalogens are also significant components of subcellular membranes including the nucleus, ER, post-Golgi network and mitochondria; however, they have not been detected in peroxisome membranes . They are also concentrated in specialized membranes, such as sarcolemma and myelin, and secreted membranes such as synaptic vesicles, secretory granules, and surfactant. The lowest amounts of plasmalogen are found in liver. This could be explained by their synthesis in liver, and subsequent transport by lipoproteins to other tissues . Tissue plasmalogen levels also relate to organism age. Healthy neonates have significantly lower erythrocyte plasmalogen content than older children . The total amount of brain plasmalogens increases dramatically during the developmental phase of myelination and reaches maximum levels by around age 30 years . Finally, plasmalogen content of tissues generally decreases in aged mammals [11,12]. Table 1. Plasmalogen content in different mammalian tissues. a) Total phospholipid content includes cardiolipin, GPEtn, PlsEtn, GPCho, PlsCho, GPIns, GPser, and sphingomyelin. b) Methods to measure plasmalogens include thin layer chromatography, gas chromatography, NMR, and mass spectroscopy. The methodology to measure tissue plasmalogens has undergone considerable refinement over the past few decades. In the past, GP species were separated by thin layer, paper or column chromatography methods after cleavage of the 1-0-(1Z-alkenyl) groups by iodine addition, exposure to HCL fumes, or other preparations of the aldehyde derivative. These methods were cumbersome and subject to differences in plasmalogen recoveries . Currently, plasmalogens are measured after trans methylation of the tissue phospholipid fraction, which converts 1-0-(1Z-alkenyl) groups to dimethylacetals and fatty acids to methyl esters, followed by gas chromatography to identify these derivatives . The relative plasmalogen amount is calculated as a ratio of dimethylacetals to methyl esters. However, the full diversity of plasmalogen species cannot be appreciated by this method, and it is being replaced by liquid chromatography tandem mass spectrometry (LC–MS/MS) methods. LC–MS/MS can accurately identify low levels of lipids in complex mixtures and provide characteristic fragment ions for the head group class and fatty acids/alcohols esterified to the glycerol backbone. This facilitates the identification of different plasmalogen subspecies, as well as novel plasmalogens that may have tissue specific functions. Quantification is performed on a relative or absolute basis, with the use of labeled internal standards [15,16]. Ether lipids are synthesized in a common pathway that begins with the association of the peroxisomal matrix enzymes, glyceronephosphate O-acyltransferase (GNPAT) and alkylglycerone phosphate synthase (AGPS), on the luminal side of the peroxisome membrane (Fig. 2) (for review, see . The initial reaction step is the acylation of dihydroxyacetone phosphate (DHAP) at the sn-1 position by GNPAT, transfer of acyl-DHAP across the enzyme active sites, followed by the exchange of the acyl group (fatty acid) for an alkyl group (fatty alcohol) by AGPS . Fig. 2. 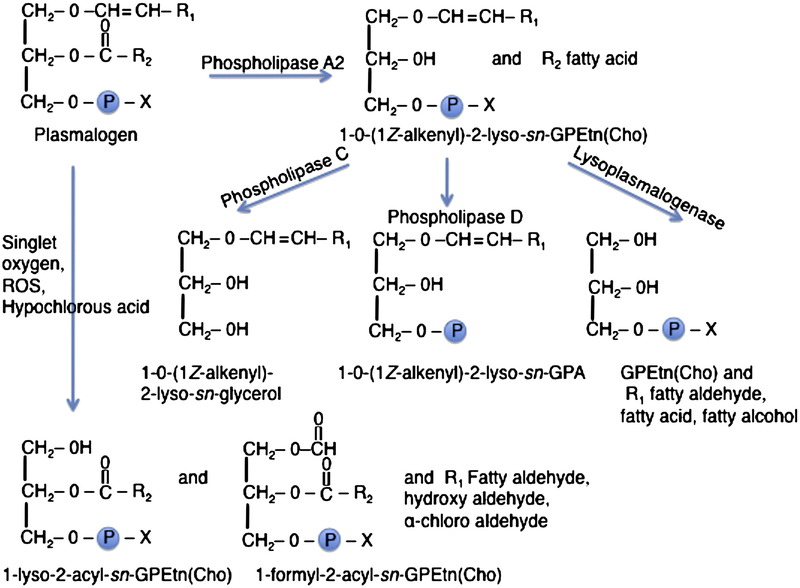 Metabolic pathway for plasmalogen synthesis. Species indicated by (Cho) represent the choline equivalent of the corresponding GPEtn species. Enzymes are: (1) fatty alcohol reductase 1, (2) glycerone phosphate O-acyltransferase, (3) alkylglycerone phosphate synthase, (4) alkyl/acyl DHAP reductase, (5) alkyl/acyl glycerophosphate acyltransferase, (6) phosphatidic acid phosphatase, (7) ethanolamine (choline) phosphotransferase (8) plasmenylethanolamine desaturase, (9) phospholipase C, (10) choline phosphotransferase. 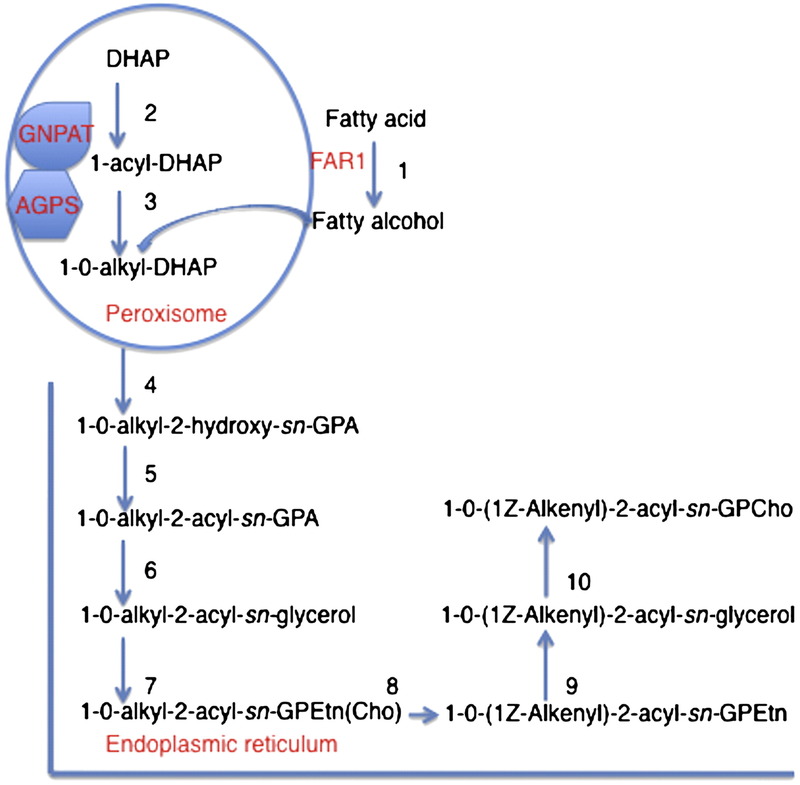 Evidence that GNPAT and AGPS physically interact is supported by crosslinking experiments in human fibroblast homogenates that showed high molecular weight complexes of sizes consistent with a stoichiometry of two AGPS and one GNPAT molecule . Although the monomeric enzymes retain activity in whole cell lysates, complexing may be required for substrate channeling inside the peroxisome to increase reaction efficiency . In AGPS null fibroblasts, there is a reduction in GNPAT levels and activity consistent with a requirement for AGPS protein to maintain complex stability. Recently, Itzkovitz et al. using fibroblasts from patients with different AGPS missense alleles, showed that only a catalytically active AGPS could promote GNPAT enzyme activity, thus further defining the requirement for substrate channeling in this reaction. The AGPS reaction follows a ‘ping-pong’ mechanism at the active site, where the fatty acid is removed from DHAP before the binding of the fatty alcohol . The recently solved crystal structure of AGPS  is consistent with this mechanism, and shows a hydrophobic tunnel able to contain a 16 carbon chain, a gating helix that functions in substrate binding and product release, and a catalytic center that forms a flavin linked intermediate with DHAP to form the ether bond. 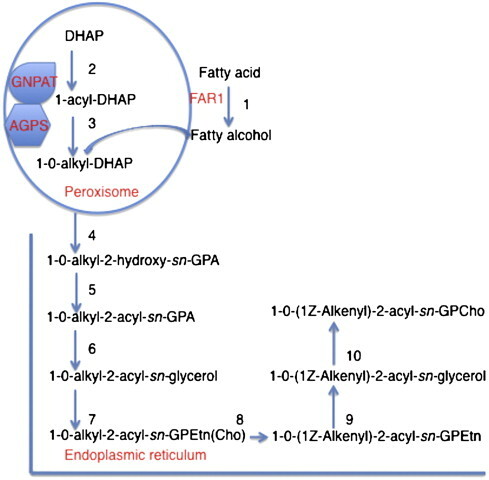 The 1-alkyl-DHAP formed is reduced to 1-0-alkyl-2-hydroxy-sn-glycerophosphate (GPA) by an acyl/alkyl-DHAP reductase located in both peroxisomal and ER membranes . Further modifications to form mature plasmalogens take place in the ER and are similar to those utilized for diacyl GP. First, an acyl group is placed at the sn-2 position by an alkyl/acyl-GPA acyltransferase and the phosphate group is removed by phosphatidic acid phosphatase, to form the corresponding 1-0-alkyl-2-acyl-sn-glycerol. Ethanolamine phosphotransferase, in the presence of CDP-ethanolamine, results in the formation of 1-0-alkyl-2-acyl-sn-GPEtn. This compound is dehydrogenated at the 1- and 2-positions of the alkyl group by a cytochrome b5-dependent microsomal electron transport system and plasmenylethanolamine desaturase, to form the vinyl ether bond of plasmalogens. Plasmanylcholine is similarly formed from 1-0-alkyl-2-acyl-sn-glycerol using choline phosphotransferase. However, since there is no plasmenylcholine desaturase, choline plasmalogens are formed only after hydrolysis of ethanolamine plasmalogens, forming 1-0-(1Z-alkenyl)-2-acyl-sn-glycerol, which can then be modified by choline phosphotransferase and CDP-choline . The proposed rate-limiting step of ether lipid synthesis is the generation of the fatty alcohol by FAR1, a fatty alcohol reductase that preferentially reduces C16 and C18 fatty acyl-CoAs. Although FAR1 does not have a peroxisome matrix targeting signal nor a classic trans membrane domain, it is found tightly bound to the peroxisome membrane on the cytosolic face . A similar enzyme, FAR2, is less broadly distributed in murine tissues than FAR1, and may have more specialized functions. FAR1 is subject to feedback regulation by cellular plasmalogen levels, which induce FAR1 protein degradation . The mechanism of this feedback regulation, which would include transmission of the cellular signal for plasmalogen levels from the ER to the peroxisome, remains to be determined. The fatty alcohol substrate for AGPS could also be derived directly from dietary intake. Although it can be synthesized within the peroxisome from acetyl-CoA supplied by β-oxidation , this pathway is not likely to be significant given that plasmalogen levels are normal in patients with single enzyme defects in peroxisomal β-oxidation. Membrane lipids produced in the ER are transported to organelle and plasma membranes through vesicular pathways involving Golgi and endosomal compartments, or non-vesicular pathways using lipid transporter proteins. A recent study in CHO cells demonstrated that PlsEtn was transported to cell membranes via a non-vesicular pathway dependent on cellular ATP levels . Nascent lipids are asymmetrically distributed to the inner or outer plasma membrane leaflet, with GPEtn species concentrated on the inner, and GPCho on the external leaflet. Membrane plasmalogen composition is tightly controlled by synthesis, remodeling, signaling induced hydrolysis and degradation. Signaling induced hydrolysis at sn-2 occurs through receptor mediated stimulation of a phospholipase A2 (PLA2) that is calcium independent, plasmalogen selective and tissue specific . In plasmalogen remodeling the sn-2 acyl group removed by PLA2 is replaced with a different acyl group via lysophospholipid acyltransferases. Phospholipase C hydrolyzes the bond between phosphate and the glycerol backbone, and phospholipase D hydrolyzes the bond between phosphate and the head group (Fig. 3). These reactions produce a series of lipid messengers parallel to that of diacyl GP: 1-0-(1Z-alkenyl)-2-lyso-sn-GPEtn and 1-0-(1Z-alkenyl)-2-lyso-sn-GPCho, 1-0-(1Z-alkenyl)-2-lyso-sn-GPA, and 1-0-(1Z-alkenyl)-2-lyso-sn-glycerol. Lysoplasmalogenase is specific for the sn-2-deacylated (lyso) form of plasmalogen and catalyzes hydrolytic cleavage of the vinyl ether bond, forming fatty aldehyde and GPEtn or GPCho. The latter can be re-acylated to form the corresponding diacyl GP, and the fatty aldehyde can be oxidized to a fatty acid or reduced to a fatty alcohol. Lysoplasmalogenase activity in tissues inversely correlates to plasmalogen levels, being lowest in brain and heart, and highest in liver and small intestinal mucosa and may also be important in regulating tissue plasmalogen levels . The ether bond in alkylglycerols can be oxidized by glycerol-ether monooxygenase, which releases the fatty aldehyde, and results in a free hydroxyl group at the sn-1 position . Fig. 3. Pathways involved in turnover, remodeling and degradation of plasmalogens. X denotes the polar head group, which is typically ethanolamine or choline. R1 denotes the carbon chain at the sn-1 position, and R2 at the sn-2 position. Species indicated by (Cho) represent the choline equivalent of the corresponding GPEtn species. See text for discussion. Data generated from a 5 minute intravenous infusion of labeled C16:0 fatty alcohol, hexadecanol, into adult rats, showed 90% incorporation into plasmalogens in brain gray matter, with less than 10% in myelin. Furthermore, the half-life of plasmalogens in brain gray matter was 10–30 min, and 10–30 days in myelin . This is consistent with a metabolically active role for gray matter plasmalogens, and a relatively inactive, or structural role for myelin plasmalogens. In concordance, plasmalogen species with a high degree of unsaturation at the sn-2 position are enriched in gray matter, where they are thought to facilitate membrane fusion events, cell–cell communication and provide a reservoir for bioactive signaling lipids. Saturated or monounsaturated species predominate in myelin, enabling a more compact and stable structure . The majority of plasma membrane lipids are GP. Structurally, they help maintain membrane physical bilayer properties such as phase transition temperature from gel to fluid state, area per molecule, packing of acyl chains and lateral domains . They are also required for the proper function of integral membrane proteins and for the generation of lipid second messengers. Plasmalogen species add several unique functions that are a direct property of the sn-1 vinyl ether bond and the enrichment of polyunsaturated fatty acids at the sn-2 position. Although the sn-1 acyl chain is always oriented perpendicular to the membrane surface, in diacyl GP the sn-2 acyl chain contains a bend that increases the molecular cross sectional area. In PlsEtn and PlsCho, NMR analysis predicts the absence of this bend, thus bringing the proximal portions of the sn-1 and sn-2 chains closer together and nearly parallel [34,35]. The resulting, effectively longer, aliphatic chain decreases fluidity, increases order and promotes the formation of non-bilayer phases at lower temperatures; the latter are necessary for fusion and fission events. In addition, the lack of the carbonyl oxygen at sn-1 reduces hydrophilicity of plasmalogens. This is an exclusive attribute of the vinyl ether bond, as these properties are not observed in plasmanyl GP. Lipid raft microdomains are lateral membrane domains, enriched in cholesterol and sphingomyelin, and form a ‘liquid ordered phase’ combining the higher order and melting temperatures of a solid with the higher translational mobility of a liquid. These domains contain proteins required for cell signaling, cell–cell interactions, and endocytosis. Pike et al. show that lipid rafts, isolated from human epidermal carcinoma cells contain a 30% increase in total PlsEtn as compared to whole plasma membrane fractions, which is further enriched in AA. Honsho et al. found 1.7 fold enrichment of plasmalogens in lipid raft domains of CHO cells. The enrichment of plasmalogens in lipid rafts, if universal, might facilitate membrane phase and signal transduction processes. In addition to altering membrane properties, the hydrogen atoms adjacent to the vinyl ether bond have relatively low disassociation energies and are preferentially oxidized over diacyl GP when exposed to various free radicals and singlet oxygen . Plasmalogens are consumed in this reaction. This was proposed to spare the oxidation of polyunsaturated fatty acids and other vulnerable membrane lipids, suggesting a role for plasmalogens as sacrificial oxidants. Sindelar et al. showed that the oxidative products of plasmalogens are unable to further propagate lipid peroxidation; thus plasmalogens may terminate lipid oxidation. However, it remains to be determined whether the oxidative products themselves might be harmful, and these include free aldehydes, 1-hydroxy (or lyso)-2-acyl-sn-GP, 1-formyl-2-acyl-sn-GP, allelic hydroperoxides, epoxides and hemiacetals  (Fig. 3). Since plasmalogens are enriched in AA and DHA, they may function as reservoirs for these biologically active lipid mediators, released by PLA2 hydrolysis. AA is a substrate for the synthesis of prostaglandins, thromboxanes and leukotrienes; DHA derived mediators are resolvins, docosatrienes and neuroprotectins, all of which regulate inflammatory responses . Finally, high levels of lysoplasmalogen, in addition to membrane perturbing effects, are associated with electrophysiological disturbances in myocytes, inhibition of Na+–K+-ATPase in renal cells and activation of cAMP-dependent protein kinase A . The only known inherited causes of plasmalogen deficiency are the peroxisomal disorders, RCDP and Zellweger spectrum. Whereas plasmalogen deficiency contributes to pathology in Zellweger spectrum, it is the direct and primary cause of pathology in RCDP. The overall incidence of RCDP is ~ 1/100,000. The majority of RCDP cases are due to mutations in the gene encoding the peroxisomal protein transporter, PEX7 (RCDP type 1) and the remainder are caused by defects in the genes encoding the two peroxisomal enzymes required to initiate plasmalogen synthesis. These are GNPAT in which defects cause RCDP type 2 and AGPS in which defects cause RCDP type 3. Although the PEX7 transporter is required for peroxisome localization of AGPS, PhyH and thiolase, only AGPS deficiency determines the RCDP phenotype. This is supported by indistinguishable phenotypes amongst all RCDP types and a direct correlation between phenotype severity and amounts of residual plasmalogens. Milder patients, although representing only 10% of RCDP, have ~ 1/3 of normal erythrocyte plasmalogens, which is a 10–40 fold increase over classical RCDP [21,41]. Finally, patients with PEX7 defects and near-normal erythrocyte plasmalogen levels do not resemble RCDP at all, and instead manifest a phenotype similar to adult Refsum disease (ARD), secondary to phytanic acid accumulation over time [41,42]. Patients with classical RCDP have a skeletal dysplasia characterized by rhizomelia, chondrodysplasia punctata (CDP) or premature calcifications in epiphyseal cartilage, delayed calcification of vertebral bodies and metaphyseal abnormalities. Mineralization of cartilaginous structures that normally do not ossify, like the larynx, trachea and intervertebral discs, is also observed. Thus, there are components of abnormal, premature and delayed mineralization of cartilage. Rhizomelia and CDP can be detected as early as 18 weeks of gestation by routine ultrasound . Postnatal X-rays document progressive epiphyseal changes, along with metaphyseal splaying and irregularities involving multiple bones. This results in profound growth retardation and limited joint mobility. Growth plates show foci of degenerating resting zone chondrocytes, and small and disorganized hypertrophic chondrocytes [44,45]. Few developmental milestones are obtained and most patients have seizures. Central nervous system abnormalities are common, but nonspecific, and include progressive cerebral atrophy with accompanying ventricular enlargement, and decrease in white matter with gliosis . Although neuronal migration defects are not typically observed in RCDP, dysplastic olivary bodies have been reported more than once, and a single patient was reported with bifrontal pachygyria and polymicrogyria . Spinal stenosis and spinal cord tethering has also been reported . Abnormalities of myelination have been documented on MRI and MR spectroscopy has shown increased levels of mobile lipids and myo-inositol, reduced levels of choline, and the presence of acetate [48,49]. Cortical cataracts appear in the neonatal period. Histological studies of lens showed proliferation of large, swollen epithelial cells not forming any true lens fibers . There is also an increased frequency of cleft palate, cardiac and renal malformations in RCDP patients [51,52]. Survival is decreased; 50% are alive at 6 years of age and most succumb by adolescence. Pulmonary hypoplasia may underlie some neonatal deaths  and chronic respiratory compromise is often the cause of death in older patients . In summary, these phenotypes demonstrate that plasmalogens are critical for brain, lens and bone development and their deficiency predisposes to cleft palate, cardiac and renal malformations, and to pulmonary disease. Finally, the progressive changes in RCDP highlight the sustained roles of plasmalogens in life-long tissue maintenance. The current availability of several RCDP mouse models should facilitate a better understanding of their roles in affected tissues (see accompanying review by Brites). Numerous studies have been performed in PEX7, AGPS or GNPAT deficient cell lines and provide evidence for cell-based plasmalogen functions discussed below. Plasmalogen deficient cells have shown consistently lower fluorescence anisotropies of membrane-bound fluorophores as compared to controls, indicating higher membrane lipid mobility and decreased order . However, fluorescence anisotropies are similar in membrane lipids extracted from plasmalogen deficient and control cells, indicating that additional properties of intact cell membranes such as lateral domain organization and lipid–protein interactions might play a role in the results obtained from intact cells . Structural alterations in membranes were directly observed in cultured fibroblasts from patients with RCDP2 and RCDP3. Thai et al. showed reduced number of smaller caveolae, flattened clathrin coated pits, dilated ER and Golgi cisternae with accumulation of proteins inside, cholesterol accumulation in perinuclear structures and reduced rate of transferrin receptor endocytosis in clathrin pits. Membrane signaling defects have also been demonstrated. Perichon et al. , using fibroblasts from RCDP1 and Zellweger patients, as well as AGPS deficient CHO cells showed decreased muscarinic cholinergic signal transduction, measured by carbachol induction of low-Km GTPase activity and reduced amyloid precursor protein (APP) secretion. All protein subunits of the GTPase were intact and APP levels were otherwise normal, indicating a specific membrane defect in these cell lines. Styger et al. demonstrated higher β-adrenergic receptor numbers and isoproterenol stimulated cAMP responses in fibroblasts from Zellweger syndrome patients. This effect was reduced after plasmalogen recovery by 1-0-hexadecyl-sn-glycerol (chimyl alcohol) supplementation. Tiffany et al. showed that RCDP fibroblasts expressed 5-fold fewer plasma membrane interleukin-1 (IL1) receptors than control cell lines, higher basal prostaglandin E2 (PGE2) levels and exaggerated IL1 stimulated PGE2 levels. Van der Hoek et al. noted the absence of plasma Lipoprotein a Lp[a] in severe ZS and RCDP patients unrelated to Lp[a] size polymorphisms and in spite of normal protein synthesis in liver. The authors proposed that plasmalogen deficiency impaired the cellular secretion of Lp[a]. Mandel et al. demonstrated decreased HDL mediated cholesterol efflux in RCDP2 fibroblasts and a murine GNPT deficient macrophage cell line (RAW 108). Munn et al. further analyzed this cholesterol trafficking defect in AGPS and GNPAT deficient CHO cells. They showed a defect in cholesterol transport from the cell surface or endocytic compartments to the ER, where it is esterified by Acyl-CoA: cholesterol acyltransferase (ACAT). However, the movement of cholesterol from the ER or endocytic compartments to the plasma membrane was normal, as well as general vesicular protein trafficking in these cells. Thus plasmalogen deficiency did not alter the rate of cholesterol transfer to HDL, instead it reduced the pool of cholesterol available for efflux. The mutant phenotype in both studies was corrected by supplementation with chimyl alcohol. Further expanding on this work, Mankidy et al. using GNPAT deficient CHO cells showed that cholesterol esterification depends on PlsEtn containing polyunsaturated fatty acids. These cells had higher total and free, but less esterified cholesterol in total cell lysates. After supplementation with 1-0-hexadecyl-2-acyl-sn-glycerol, only PlsEtn with ≥ 3 unsaturations (DHA, AA and linolenic acid) could significantly reduce free and increase esterified cholesterol. Supplementation of HEK293 cells with 1-0-hexadecyl-2-DHA-sn-glycerol resulted in increased cellular ACAT levels, thus providing a mechanism for the observed increased cholesterol esterification. Taken together these studies are consistent with a defect in the transport of LDL-derived cholesterol from the cell surface and/or endocytic compartments to the ER , resulting in accumulation of free cholesterol , reduced esterified cholesterol  and less cholesterol available for HDL mediated efflux . CHO cells incorporate 12-(1′-pyrene) dodecanoate into membrane lipids. Subsequent excitation of the pyrene moiety by long wavelength UV light under aerobic conditions generates singlet oxygen and may initiate radical species, causing cell death. Zoeller et al. showed that plasmalogen deficient CHO cells are more sensitive to cell death than wild type cells. This effect was corrected when chimyl alcohol was added to the culture media. Furthermore, plasmalogens in wild type CHO cells were specifically degraded by this treatment, and the products suggested a mechanism of cycloaddition of the singlet oxygen to the vinyl ether linkage, generating a dioxetane intermediate or a hydroperoxide. Subsequent hydrolysis would release 2-monoacyl GPEtn and the corresponding fatty aldehyde. UV resistance could be restored with chimyl alcohol, and was confirmed in RCDP fibroblasts by Hoefler et al. . In addition, Zoeller et al. , demonstrated that plasmalogen deficient RAW cells, were more sensitive to chemical hypoxia, superoxides and singlet oxygen. Recovery required the presence of plasmalogens, and not their alkyl ether analogs. Overall, experimental evidence indicates the preferential oxidation of the vinyl ether bond in plasmalogens over double bonds in other membrane lipids. Although plasmalogen deficient cells may be more sensitive to reactive oxygen species (ROS), it is not clear that ROS levels are higher in these cells. Jansen and Wanders showed that ROS species were not increased in RCDP and Zellweger syndrome fibroblasts compared to wild type cells, using the free radical inducer, menadione as an intracellular generator of reactive oxygen species, and cytochrome C reduction as an extracellular indicator of ROS. However, Khan et al. used siRNA to reduce GNPAT levels in rat glial cells and measured increased ROS species by the membrane permeable fluorescent dye, DCFH2-DA. Finally, although not using a plasmalogen deficient cell line, Zoeller et al. showed that increasing plasmalogen levels in human pulmonary artery endothelial cells protected them during hypoxia by prolonging survival and reducing reactive oxygen species accumulation. Zoeller et al. showed decreased DHA levels in RAW cell lines. Supplementation with the plasmalogen precursor, chimyl alcohol, restored both PlsEtn and DHA levels, supporting the notion that DHA is primarily targeted to PlsEtn during its biosynthesis. However, this was not the case for AA. In wild type cells, AA release was mainly from PlsEtn, while in plasmalogen deficient cells, the diacyl GPEtn species was increased to compensate. Thus, DHA targeting may be more selective for plasmalogen species than AA in some tissues. Rizzo et al. demonstrated fatty alcohol accumulation in fibroblasts and plasma from RCDP and ZSD patients due to their impaired incorporation into ether lipids. In fibroblasts, fatty alcohols accumulated only after addition of palmitic acid (C16:0), which increased FAR activity without increasing fatty alcohol oxidation. We have focused on three common disease states– respiratory disorders, Alzheimer disease and inflammatory conditions– in which there has been cumulative evidence for plasmalogen deficiency in order to highlight general themes that would be more widely applicable. These conditions emphasize the structural, anti-oxidant and signaling roles of plasmalogens. They also emphasize how these general roles are adapted to tissue specific functions. Secondary plasmalogen deficiency could result from decreased synthesis and/or increased degradation. Several studies have reported an association between reduced plasmalogens and bronchopulmonary dysplasia (BPD), a leading cause of morbidity in prematurely born infants. Lower plasmalogen levels in tracheal aspirates from premature infants increase their risk to develop BPD . Premature infants who received surfactant preparations with higher plasmalogen content had better respiratory outcomes . The addition of small amounts (2 mol%) of plasmalogens to surfactant-like phospholipid mixtures further reduces surface tension and viscosity , suggesting that a structural role for plasmalogens in surfactant. Since plasmalogen levels are relatively low in newborns, this may place the premature group at higher risk for plasmalogen deficiency. Asthma prevalence is associated with ozone exposure, a chemically reactive gas present in air pollution. Its damaging effects may relate to oxidation of surfactant lipids . Exposure of murine surfactant to ozone selectively decreased plasmalogens by ~ 53%, whereas diacyl species were not significantly decreased compared to controls. There was a corresponding increase in 1-hydroxy-2-acyl-sn-GPEtn and aldehyde derivatives, indicating specific degradation at the vinyl ether bond of plasmalogens. Plasmalogen deficiency has also been linked to chronic obstructive pulmonary disease (COPD). Metabolic profiling in a large cohort of COPD patients showed a statistically significant correlation between plasmalogen deficiency and smoking; this was corroborated by finding down-regulation of AGPS transcript in lung tissue from smokers, suggesting a decrease in plasmalogen synthesis . MALDI imaging MS, used to investigate anatomical distribution of lipid species in histological sections of lung, showed that plasmalogens were enriched on the edges of large and small airways, most likely in pulmonary epithelial cell membranes . Interestingly, peroxisome numbers were substantially increased in Clara and alveolar type II pulmonary epithelial cells, implying an increased requirement for peroxisome metabolism that would include plasmalogen synthesis . Since the lung is a direct target of ROS, plasmalogens might protect against respiratory disease by virtue of their role as an anti-oxidant. Lung plasmalogens are particularly enriched in AA, also suggesting a role in immune defenses. Finally, plasmalogens contribute a structural role to surfactant. Taken together with the high respiratory morbidity observed in RCDP patients, these data suggest that plasmalogen may have key roles in normal lung physiology. Since brain contains the highest amounts of tissue plasmalogens, it is not surprising that reduced brain plasmalogens can be demonstrated in various neurodegenerative disorders. These include Alzheimer disease , Parkinson’s disease , Neimann Pick type C , Down syndrome  and experimental autoimmune encephalomyelitis . However, it remains to be determined whether plasmalogen loss is a contributing cause or downstream effect of pathology. It may be both, as demonstrated by the finding that plasmalogen deficiency further aggravates brain injury in the X-ALD mouse model . In addition, decreased PlsEtn in brain white matter from cerebral ALD patients is related to increased ROS species . 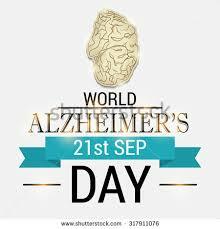 We will use Alzheimer disease as a paradigm for discussing plasmalogen deficiency in neurodegenerative disorders, demonstrating that secondary plasmalogen loss does not preclude its further contribution to disease progression. The pathophysiology of AD involves several factors including the accumulation of neurofibrillary tangles (NFT), composed of intracellular tau bodies, accumulation of extracellular amyloid β peptide (Aβ) plaques and synaptic loss . Oxidative and inflammatory damage pursue. Although the only predictive factor for AD aside from age is an ApoE4 genotype, an increasing number of studies has shown that plasmalogen deficiency, as well as generalized peroxisome dysfunction, may also be a specific marker for AD pathology. Thus far there has been no correlation between plasmalogen deficiency and ApoE genotype, implicating that plasmalogen deficiency is an independent marker . AD patients have decreased PlsEtn and PlsCho in affected brain regions and the extent of reduction is correlated to severity of disease [84,85]. This selective plasmalogen decrease was not found in autopsy brain samples from patients with Huntington’s or Parkinson’s disease. Han et al. correlated the plasmalogen deficiency in AD with the patient’s clinical dementia stage. The investigators found a dramatic decrease of up to 40 mol% in plasmalogen content of white matter at early AD stages, and a decrease of 10 mol% in gray matter at early stages and 30 mol% in severe dementia. Wood et al. showed that erythrocyte plasmalogen levels also correlated to disease severity implying a systemic etiology for plasmalogen reduction. Kou et al. noted more extensive peroxisome-related alterations in AD brain utilizing samples from a prospective study of aging individuals. This unique study design, in which one brain hemisphere was staged pathologically and the other studied biochemically, allowed direct correlation between biochemical findings and amounts of NFT and plaques. These investigators found increased very long chain fatty acids, decreased plasmalogens containing polyunsaturated fatty acids, increased peroxisome volume density in neuronal cell bodies and decreased peroxisome numbers in neurites. These changes showed a stronger association with tau, rather than Aβ, accumulation. Although both are hallmarks of AD, NFT correlate better with disease pathology, strengthening the association of reduced peroxisome functions with AD progression. Thus reduced plasmalogens may be related to decreased synthesis secondary to general loss of peroxisome functions in AD brain. In this regard, Grimm et al. showed that increased Aβ reduces AGPS protein levels. Reduction in DHA levels observed in AD brain , could result from deficient plasmalogens. Furthermore, reduced synthesis of DHA was shown in AD liver, suggesting decreased synthesis of these precursors in the liver, as well as brain. Loss of plasmalogens in the AD brain could also occur through oxidative damage, leading to plasmalogen degradation by ROS species. In addition, increased catabolism of plasmalogens was suggested by the finding of elevated plasmalogen specific PLA2 from the nucleus basalis and hippocampal regions of AD brain [90,91]. This correlates to the observed increase in lipid remodeling, as well as reduced levels of DHA and AA in brain plasmalogen fractions [84,87]. Reduced plasmalogens might further enhance ongoing oxidative damage in AD, as well as alter membrane properties to promote further damage. The lipid environment affects APP processing, as its processing enzymes are integral membrane proteins and the Aβ cleavage takes place within the membrane. Increased membrane free cholesterol increases the production of Aβ from amyloid precursor protein (APP), whereas cholesterol esters stimulate non-amyloidogenic APP degradation . Plasmalogen deficiency, which results in higher membrane free cholesterol, would thus facilitate Aβ production. Furthermore, Aβ aggregation can be modulated by plasmalogens. Using a sensitive fluorophore assay, Lee et al. showed that, when Aβ was incubated with unilamellar vesicles composed of 1-(1Z-octadecenyl)-2-arachidonyl-sn-GPEtn, there was inhibition of oligomer formation and sluggish fibril formation. Depletion of neuroprotectin D1, a bioactive molecule derived from DHA, may also have a role in Aβ accumulation . Finally, loss of gray matter plasmalogens would be expected to adversely affect synaptic structure and function, thus potentially contributing to the synaptic dysfunction and neurotransmitter depletion observed in AD. Imbalances of major lipid signaling pathways contribute to disease progression in chronic inflammation, metabolic syndrome, type II diabetes, neurodegenerative and cardiovascular diseases. Increased lipid oxidation accompanies these pathological states and is associated with decreased plasmalogen levels. Plasmalogens are enriched in nascent lipoproteins secreted by cultured rat hepatocytes where they may serve as endogenous plasma antioxidants . Colas et al. evaluated LDL from obese patients with metabolic syndrome and patients with type II diabetes and found decreased PlsEtn levels (22% and 49% respectively), increased lipid peroxidation, decreased cholesterol ester and increased triglyceride compared to controls. PlsEtn levels were also found to be decreased by 20% in erythrocyte membranes from hyperlipidemic patients. Leukocyte myeloperoxidase generates hypochlorous acid (HOCl) from hydrogen peroxide and chloride gas, as part of immune defense reactions. Plasmalogens, already enriched in leukocytes, are one of the primary targets of HOCl due to sensitivity of the vinyl ether bond to oxidants. The rate constants for HOCl dependent plasmalogen modification are around 10 fold higher than their diacyl GP counterparts . The direct products, α-chloro fatty aldehyde and 1-lyso-2-acyl-sn-GP (Fig. 3), may produce a family of chlorinated lipids that can regulate inflammatory responses . Monocyte infiltration into atherosclerotic vascular wall and into myocardial infarct zones is associated with the accumulation of the α-chloro fatty aldehyde, 2-chlorohexadecanal, in these tissues. Similarly, neuroinflammation results in the accumulation of 2-chlorohexadecanal in brain lipids of endotoxin treated mice . Thus inflammatory conditions may deplete plasmalogen levels. In myocardial ischemia, there is early activation of plasmalogen specific PLA2, leading to plasmalogen loss. The provision of chimyl alcohol to isolated rat hearts reduced reperfusion injury following ischemia as measured by increased left ventricular function and coronary flow, reduced creatine kinase release and decreased lipid peroxidation . This study suggested that increased plasmalogen levels, secondary to chimyl alcohol supplementation, might protect against ischemic damage. Furthermore, plasmalogens may have additional functions in cardiac sarcolemma, where they are enriched. Ford and Hale  showed preferred reconstitution of the trans-sarcolemmal Na+–Ca2+ exchanger (SLC8A1) in phospholipid vesicles containing plasmalogens as compared to diacyl GP alone, suggesting a structural role for plasmalogens. Plasmalogen replacement therapy would be of substantial benefit in RCDP, and may also be of benefit in disorders that feature secondary plasmalogen deficiency. Although plasmalogens are mostly biosynthesized, small amounts can be obtained from dietary compounds . The highest amounts are found in oils of invertebrate marine animals, such as shark liver and krill oil . The average adult is estimated to consume 10–100 mg of 1-0-octadecyl-sn-glycerol (batyl alcohol) daily . Although it is the alkylglycerol content of these dietary compounds that has been more extensively studied, there is some evidence that intestinal absorption of phospholipids is superior to that of alkylglycerols . Dietary alkylglycerols are absorbed intact, however the ether bond can be subsequently oxidized in intestinal mucosal cells . As summarized by Das et al. in rodent feeding studies, only 1-0-alkylglycerols, saturated or monounsaturated, of appropriate chain length (C15-19) can be incorporated into plasmalogens. Administration of 1–2% 1-0-heptadecyl-sn-glycerol in feeds to growing rats resulted in a 40–60% incorporation of the targeted C17 moiety at the C1 position of PlsEtn in most tissues and an increase in the alkylglycerol content, but no change in total plasmalogen content . Thus the alkyl composition of plasmalogens can be altered by dietary supplementation, but the total tissue plasmalogen amount remains unchanged, perhaps reflecting control by FAR1. Nevertheless, the vast majority of endogenous mammalian plasmalogens contain only C16:0, C18:0 and C18:1 alkyl chains. Plasma lipids reflect dietary changes over a period of days, whereas changes in erythrocyte and other tissue lipids occur over several weeks . 1-0-Heptadecyl-sn-glycerol was not incorporated into tissues of newborn mouse pups after supplementation of mothers for most of the gestational period, indicating that ether lipids are not transported across the placenta to the fetus . Transfer through lactation was observed, but was less efficient than direct consumption from foods. There was also low incorporation into brain, either because alkylglycerols do not efficiently cross the blood brain barrier, or because of high turnover in brain. Since the plasmalogen precursor, 1-0-alkylglycerol, enters the plasmalogen biosynthetic pathway downstream of the peroxisomal steps (Fig. 2), it may help recover plasmalogen levels in Zellweger spectrum and RCDP patients. Recovery of tissue plasmalogen levels and various cell dependent functions after alkylglycerol supplementation has been reported using patient fibroblast cell lines, as discussed above. Several case reports show improvement in erythrocyte plasmalogen levels in PBD patients after batyl alcohol supplementation [104,106,107]. Brites et al. , using a PEX7 null mouse model, showed that high doses (around 400 mg/kg) and early supplementation were required for maximal clinical efficacy. Reduced transport across the placenta and through lactation was confirmed. Although plasmalogen levels could be recovered and tissue pathology improved in somatic tissues, this was not the case in brain, in which only around 1% of control plasmalogens were present after 2 months of treatment, and around 2% at 4 months of treatment. Wood et al. synthesized an alkyl-diacyl plasmalogen precursor, 1-0-hexadecyl-2-DHA-sn-lipoic acid on the basis that lipoic acid stabilized the oral precursor, and that tissue deficiencies of plasmalogens containing DHA could be more effectively targeted. Using their plasmalogen precursor in RCDP cell lines, these investigators showed recovery of the target, 1-0 (1Z-hexadecyl-2-DHA-sn-GPEtn as well as other 1-0 (1Z-hexadecyl)-2-acyl-GPEtn species, indicating active remodeling at sn-2. Evaluation of reduced plasmalogen species in a PEX7 hypomorphic mouse model showed the most dramatic decrements in species containing DHA, especially in brain and eye . After specific labeling of this plasmalogen precursor and providing it by gavage at 100 mg/kg for 3 days, Wood et al. showed around a 10 fold increase in incorporation of the target plasmalogen into brain and eye of PEX7 hypomorphic mice, and around a 4 fold increase in adrenal, kidney and lung tissues compared to controls. Thus greater uptake was obtained in plasmalogen deficient tissues. Overall, these studies indicate that sustained treatment periods with plasmalogen precursors will be needed to overcome turnover and reach steady state physiological levels in brain. These reports also demonstrated that rearrangement at the 1-0-alkyl group does not occur, and therefore the naturally occurring alkylglycerols, chimyl alcohol, batyl alcohol and 1-0-octadecenyl-sn-glycerol (selachyl alcohol), would need to be provided together in order to recover each plasmalogen class. Plasmalogens, by virtue of their vinyl ether bond and enrichment in DHA and AA, play a critical role in cell membranes— providing unique structural attributes, facilitating signaling processes and protecting membrane lipids from oxidation. As these factors are particular to different tissue types, plasmalogen functions are likely to be tissue and developmental stage specific. The peroxisome disorder, RCDP, reveals their roles in organ development, whereas secondary plasmalogen deficiency disorders reveal roles in tissue homeostasis. A number of useful studies have been done at the cellular level to investigate plasmalogen functions. The current availability of RCDP mouse models should enable us to more quickly evaluate these in tissue and organ systems. Furthermore, the elucidation of the spectrum of plasmalogen subspecies by LC/MSMS will contribute to better understanding of plasmalogen biology. Finally, there is a need to determine how to improve the uptake of plasmalogen precursors into the central nervous system.